Have a huge bowl of Jell-O up front, three students, and three smaller jars. Each student gets a straw. 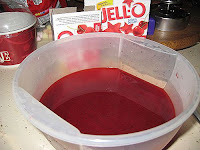 The object is to see which student can get the most Jell-O into their personal jar by slurping it out of the mother bowl and spitting it into their jar. Give them a certain amount of time and then compare jars to see who has sucked the most.